Hi everyone! It’s been a very long time since I last published a blog post! A lot has happened since then. I got engaged and I traveled to Canada to attend my brother’s graduation. Then when I came back it was already the holy month of Ramadan. After that we celebrated Eid.. and you know the summer is always full of activities! I’m really happy to be blogging again. First, I want to share with you the quilt I completed at the very beginning of this year. My best friend, all the way in Canada, asked me to do a quilt for her niece to be born then. She had a vision and she tried to communicate that to me by telling me the colors she wanted and sending me some inspiration pictures of quilts she found online. The colors she wanted me to stick to were pink and green and she liked the quilts with flowers and figures the most. My vision was a modern quilt with modern blocks, however, since she liked flowers and figures I decided to go for a garden themed quilt. I had searched online for patterns that would satisfy both visions but I didn’t really find what I was looking for. Therefore, I decided to come up with my own pattern based on the design I had in mind. My inspiration was the previous baby quilt I made for my uncle’s baby boy, Counting Sheep. The idea in my mind was to create a sky and a garden and appliqué some flowers on top with the name too. Since it had to be a pink and green quilt, I decided that the sky will be pink. I sketched the design and then I started to look for suitable fabrics for the project. Honestly, choosing fabric is the most fun part of the process yet the most mind aching at the same time! Luckily, I found a pink fabric that was perfect for my pink sky idea! The motif of the fabric is clouds and in pink!!! The fabric is Artium by Joel Dewberry. Not only that, I added pink butterflies in the sky too- using the Chasing Butterflies fabric by Lizzy House from my stash. Once it was done, it was time to send it out to the baby girl it was made for! I can’t wait to make more and more quilts! Today I want to share with you my latest accomplishments: a baby quilt. Latest actually refers to a few months back lol! This is actually my first finished quilt. 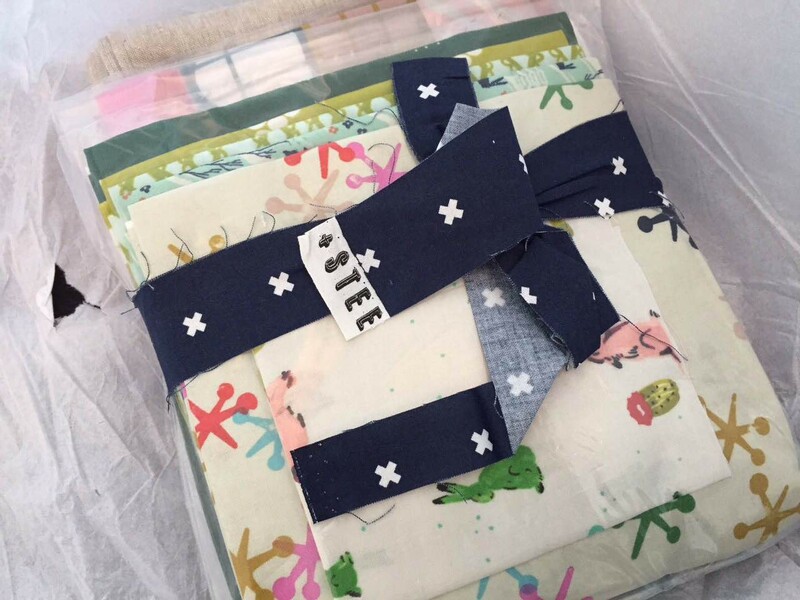 I did a baby receiving quilt mid of 2015, however, it was a self-binding quilt. 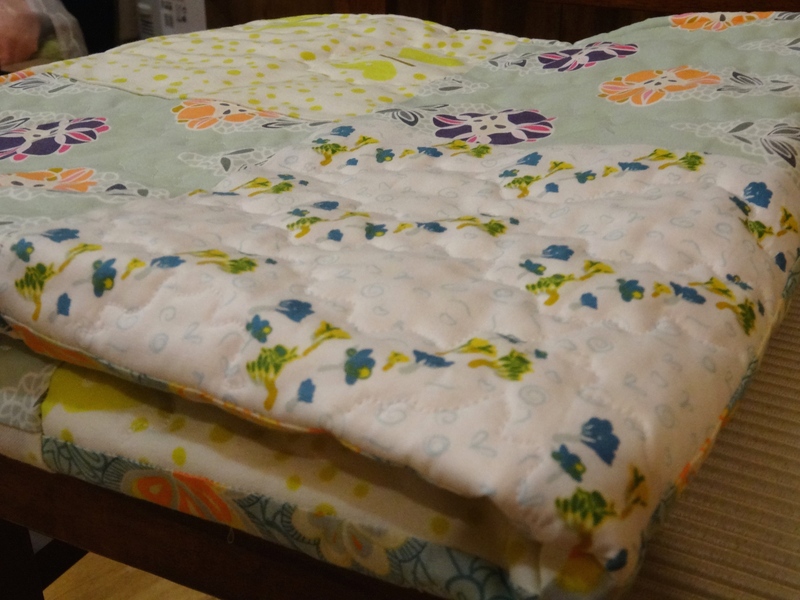 For this quilt, I tried machine binding for the first time. So about this quilt.. Sometime in May if I remember correctly, I was asked by my uncle to do a baby quilt for his first baby boy who was due to be born in October. I was thrilled and honored to receive that request. I spent the first couple of weeks trying to be inspired with an idea, a pattern, until one day I was browsing Instagram and @Iamalunsol instagram account posted a very cute Quilt Pattern “Counting Sheep” from Love Quilting Magazine! The moment I saw it, I knew this is the pattern that I wanted to do. I bought the magazine on my iPad and started working from there. The pattern was for a mini quilt, so I decided to enlarge it. I was between scaling it and enlarging it but i opted for the second choice. Choosing the fabric was a fun process as well though it is somewhat difficult since it is virtual (I purchase my fabric online). It comes to a point where you need to trust your instinct and just purchase the selection. Since I decided to enlarge it, I planned to add a certain number of pieces from each block but as I went on I had to make decisions about adding more and about the size. I basically had to improvise while working on it though I initially had a plan on how much I was enlarging it. At times it would be annoying because I would think I’m done with the ‘grass’ for example but I end up needing to cut and piece more blocks instead. It was my first time to try appliqué. As usual, I resorted to YouTube to learn the techniques out there for appliqué. I have to say I tried applying two techniques but both were a fail. I then contacted a friend in Canada who quilts as well and she told me that isn’t skilled at appliqué either. She suggested that I try zigzag sewing along the edges. Once I was done with the appliqué and basting the quilt, I spent a few days in a row quilting it. I have to say it was exhausting. 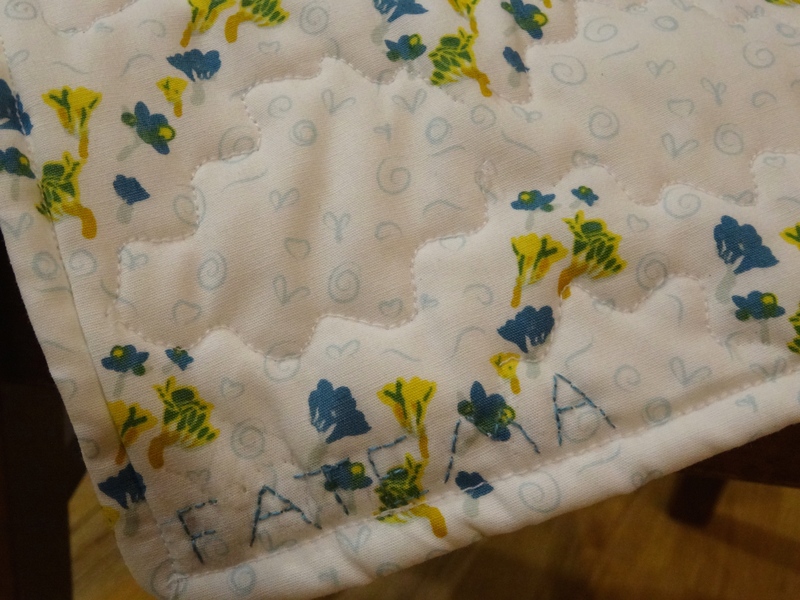 The best part about it was that I was using Aurifil Threads for the first time! I was pretty excited about that and about having the threads that match my fabric! Little things do make me excited and happy haha!! After many long hours of quilting and my machine acting up in between, I was finally done and ready for machine binding. I’ve never done binding before so I had to watch a few YouTube videos to finally start the binding myself. I have to say it wasn’t hard at all. The only tricky part was around the corners. I called my sister to focus on the YouTube video and help me figure out how the lady in the video was turning the fabric around the corner. She managed to catch the idea and help me with it. Thanks to her I managed to get my corners bounded nicely! When I was finally done, it felt surreal. Did I really do this quilt myself?! I loved it! And with every piece of art I do, handing out to another person is the hardest feeling; to let go of something that has really become apart of you. I’ve kind of been MIA, missing in action, in the past few months. There was so much going on that unfortunately I did not have time to blog or simply I was lazy to do so. Since we are in the last hours of the year 2015 I’d like to reflect on it. As I flashback the events of this year in my head, I can say it was a good year with many accomplishments. It started with the launch of this blog. I also started machine sewing which I haven’t done before. This opened up to me the chance to do bigger and more projects. I got on board with #patchworkcitybom. I completed my first baby quilt from A-Z (piecing, applique, quilting, and binding). I traveled to a dream destination, Paris! And omg how I loved it. J’adore Paris! 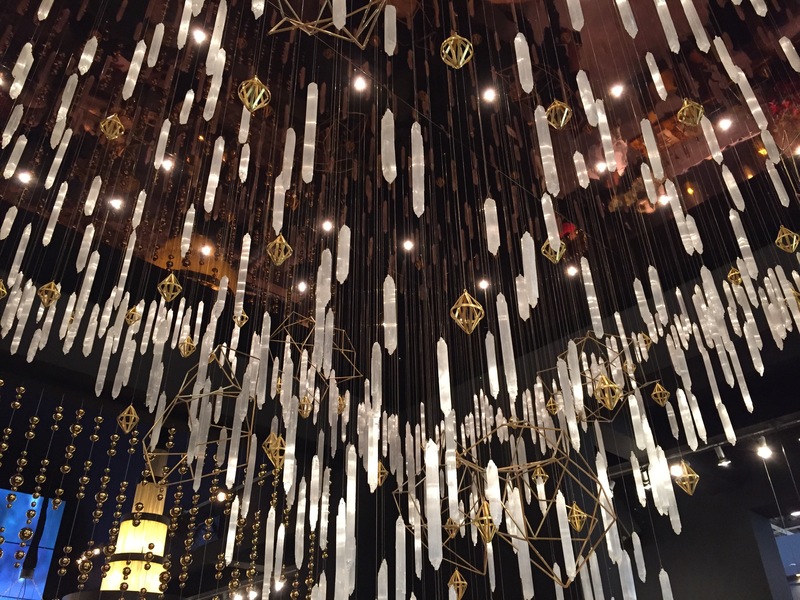 The purpose of the trip was mainly to visit the Maison&Objet exhibition, but I also spent a few more days there to tour around the city with my mom. It was my dream to go there and speak French, and I was proud of myself whenever I heard “vous parlez bien”. I actually did not think of resolutions for the year 2016 yet! But what I know: I want to be even more energetic in terms of doing what I enjoy doing the most (sewing, art, blogging). I want to complete more projects. I want to maximize my happiness as much as possible. After reading The Happiness Project by Gretchin Rubin, I truly think that it’s possible. This is what I hope to achieve in 2016! And I have a feeling it will be a good year indeed. Best wishes to all of you! Happy New Year! 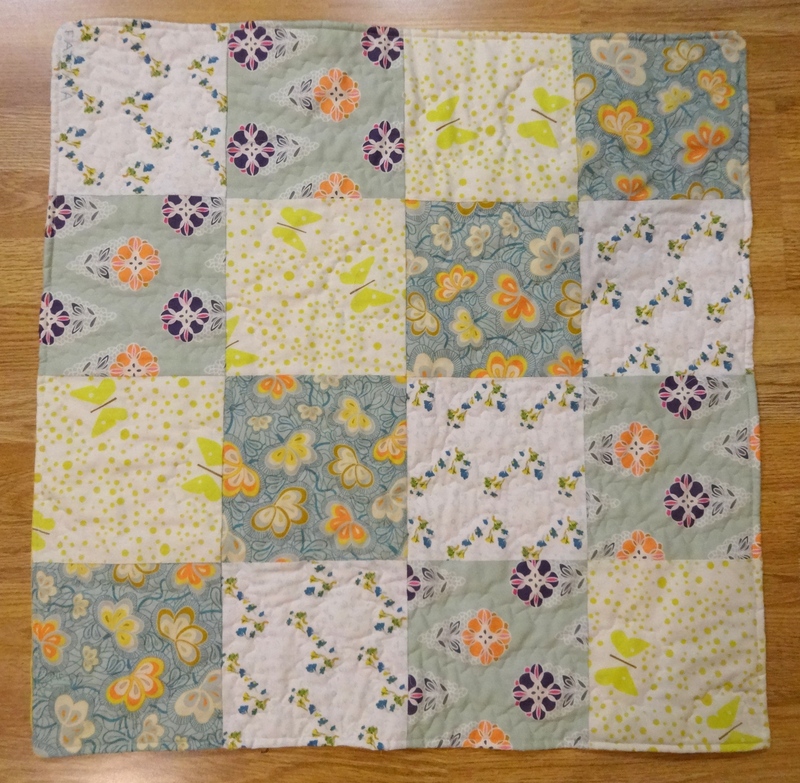 Now that I gifted this piece of art, I can finally share with you my recent doing: a baby receiving quilt! I did this quilt for a special friend’s baby boy. I used fabric from my stash, mainly from the Fantasia Collection by Sarah Lawson and one fabric from Chasing butterflies by Lizzy House. 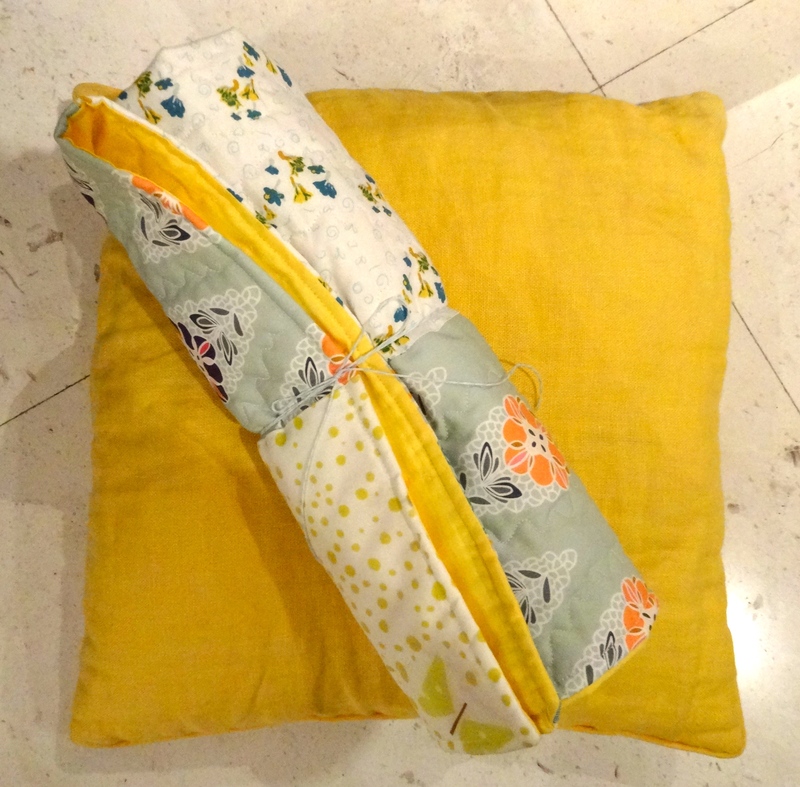 I liked the calming colors of yellow and teal for a baby, hence my choice. For the back, I decided to go with solid bright yellow. This is a very easy quick project. 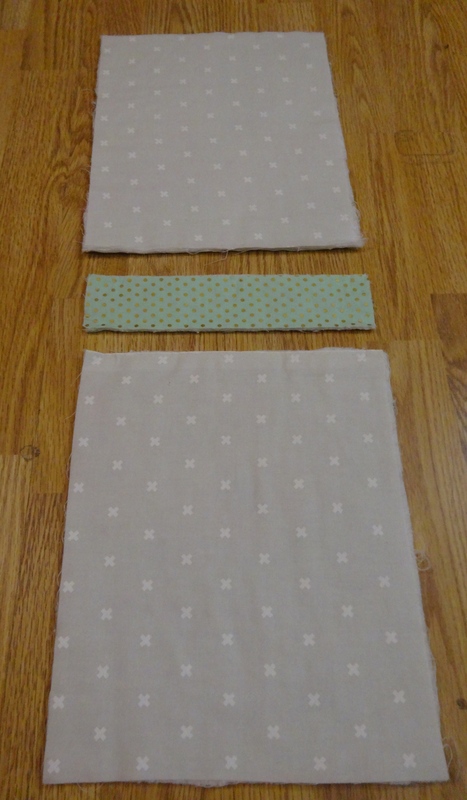 All that is required for this project is to cut four squares of four fabrics and piece them together. Batting is optional- I personally included batting because I think it makes it safer and comfier to hold a baby that way. With the batting in, you can also let the bay lie on the quilt and play. 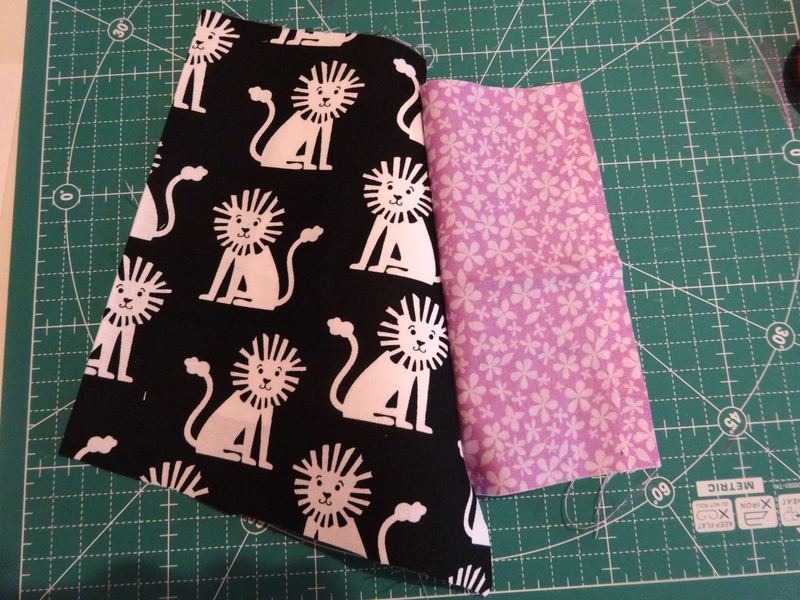 I applied the ‘self-binding’ method where I sewed the two fabrics, wrong sides against each other with one fabric basted to the batting leaving 10 inches gap. Once done, put your hand in the gap and pull the fabric out, such that you have the right sides of the fabric outside and the stitching inside. Press the quilt, pressing the edges of the non-sewn part folded in. Then go back to your sewing machine and sew along the edges of the quilt- this way you will have the gap closed, sewed without anyone noticing that it was the opened edge. Ta da the quilt is done! I decided to quilt this little baby receiving quilt. I tried machine quilting for the first time! I actually have no background in machine quilting as I’m new to a sewing machine in the first place. 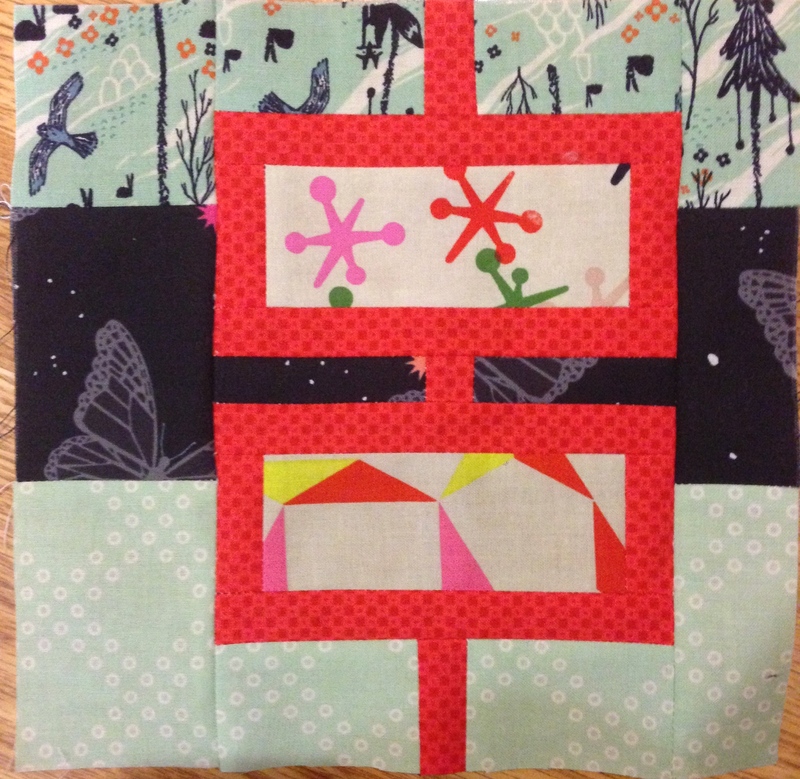 I chose the wiggly stitch option and quilted along! 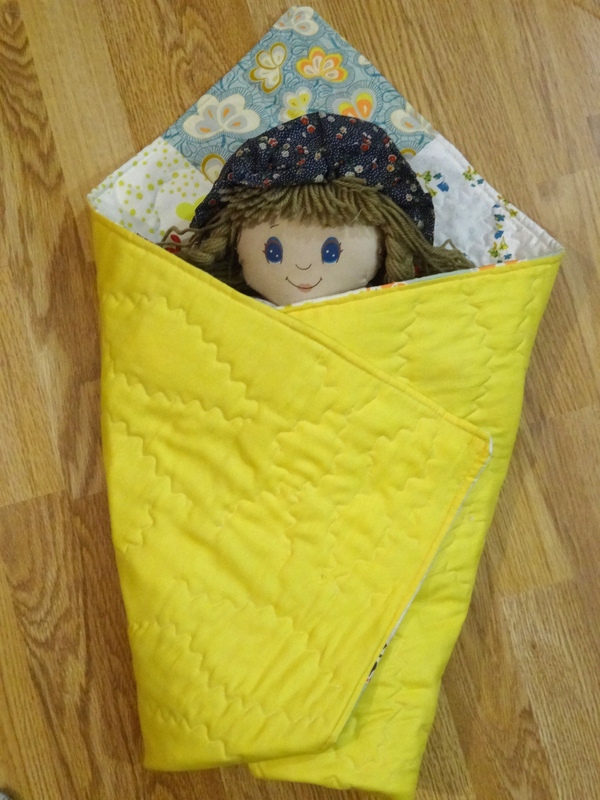 I’m so glad my friend loved and appreciated the quilt- it is truly rewarding! 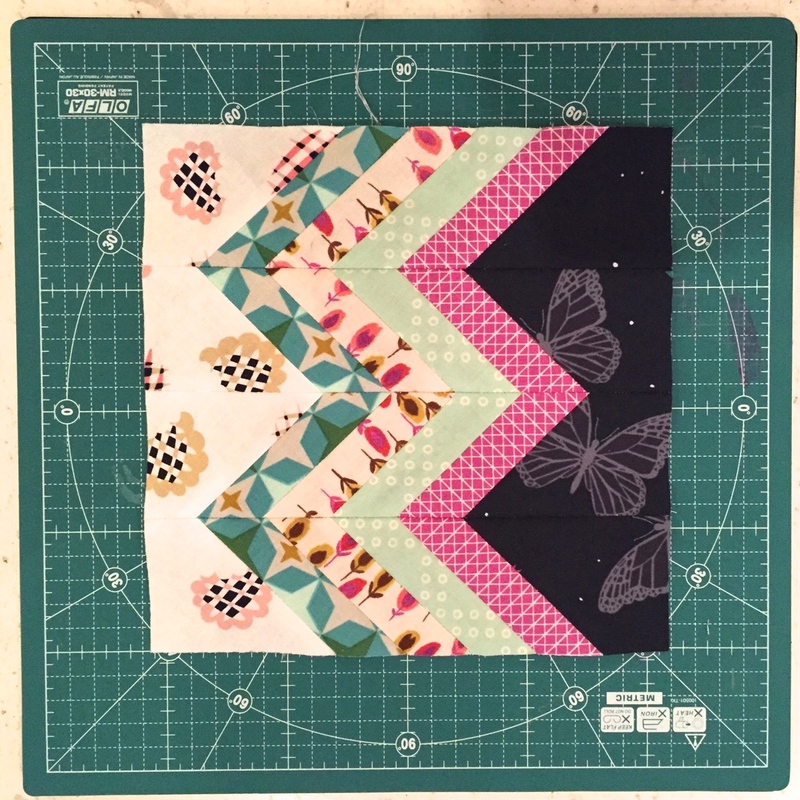 Next in my project list are: another baby quilt to a special person, a remixed geese quilt using Elizabeth by Tula Pink, start a scrapbook, finish up an album, finish up the knitted scarf I started but then I totally left aside, catch up on #westside and #metroarea quilts and plan more quilts! Section one consists of the Forest Park Block, The Parking Garage Block, and the City Hall Block. The first block I worked on is Forest Park. 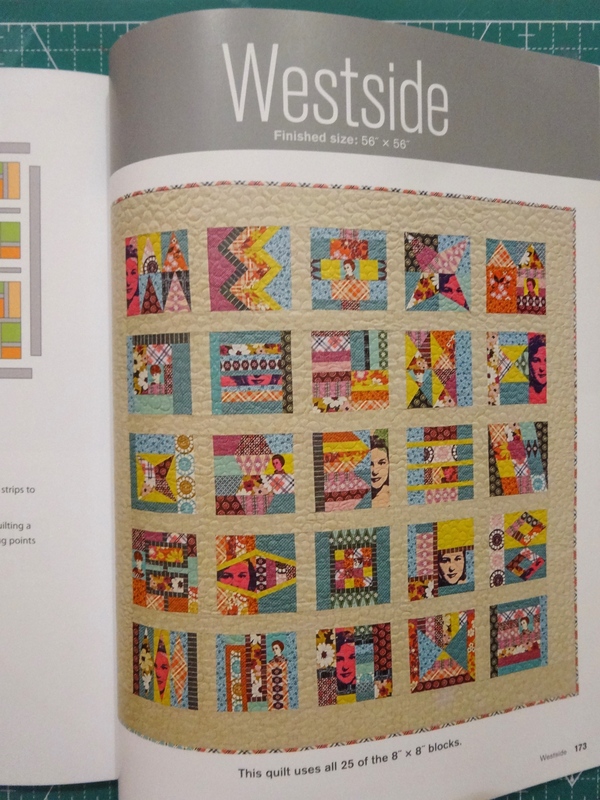 I was already familiar with this block because I’ve done it for the #westside quilt. I had a hard time doing this block for westside. 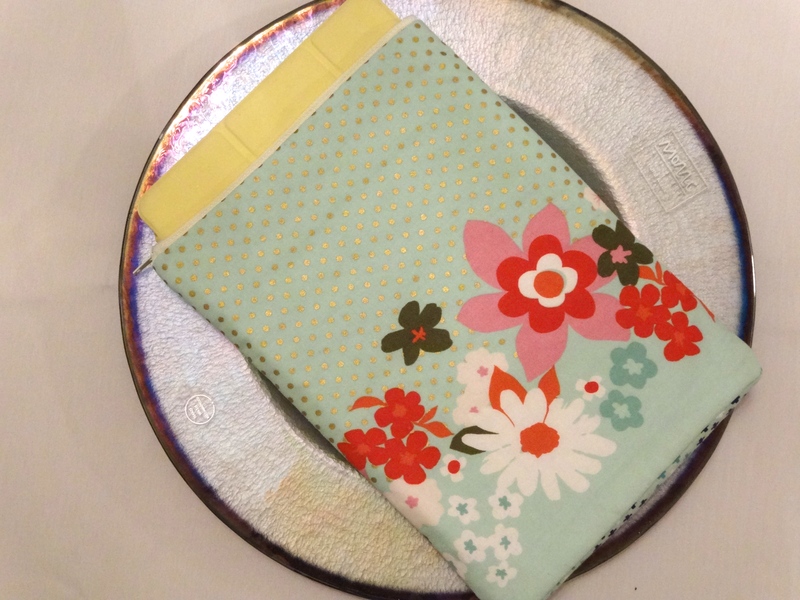 I used the freezer paper method but for some reason I had a hard time getting the block to be the size it should be. I asked a few people for help; I asked what method would they use. Some told me they did the block using the foundation paper piecing method. So this time around I decided to try this method! Once again, my friend is youtube haha. I watched a tutorial and I instantly gave the method a try! I have to say it is very easy and accurate. 1. Cut a piece of fabric that will be big enough to cover a section of the pattern drawn on the paper (I used special ‘foundation paper piecing paper’ that I bought from Amazon). In this case it is section A. My piece of fabric is way too generous but that is because I was fussy cutting. 2. Put a dab of glue stick on the paper and stick it to the fabric. The paper and the fabric’s wrong sides should face each other. 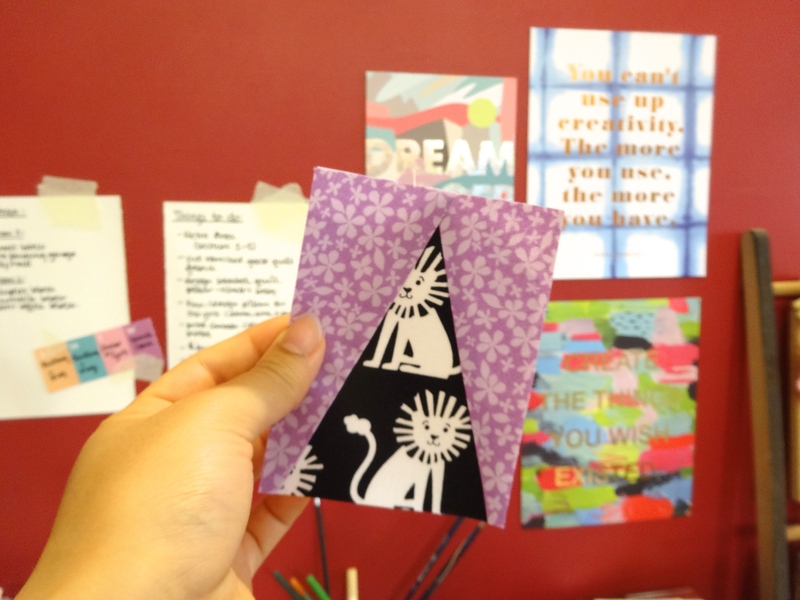 Then fold the paper at the line that marks the side of the pattern. 3. 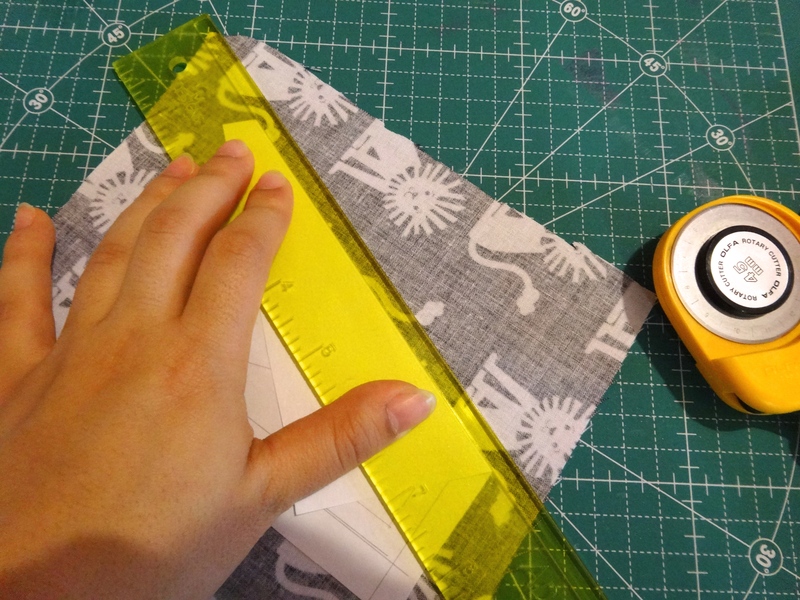 Place the ‘add on 1/4 inch ruler’ on the edge of the paper and cut the fabric. 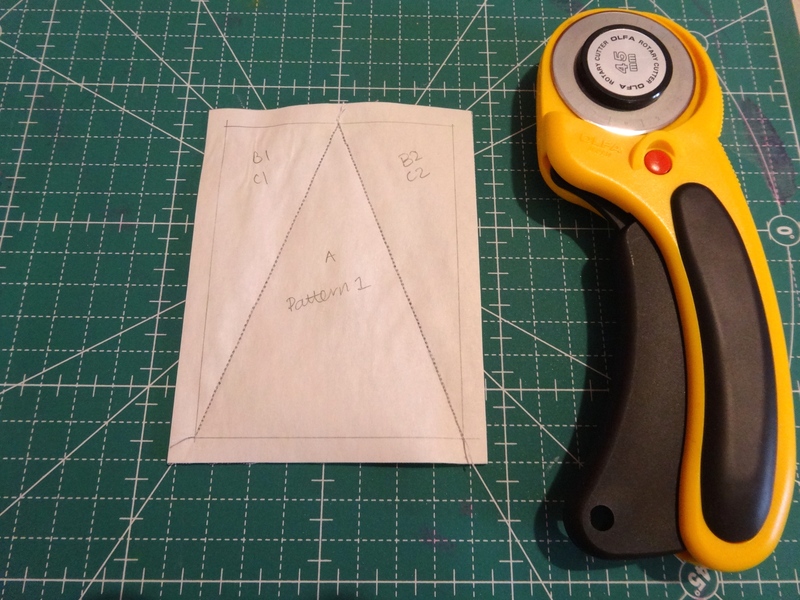 This way you will be cutting for 1/4 inch seam allowance. 5. Press the fabric and complete the other side of the pattern following the steps above. 6. Once done piecing the pieces of the pattern together press and cut the final piece adding a quarter inch for seam allowance. 7. You will then have completed the pattern. All you have to do at this point is remove the paper. 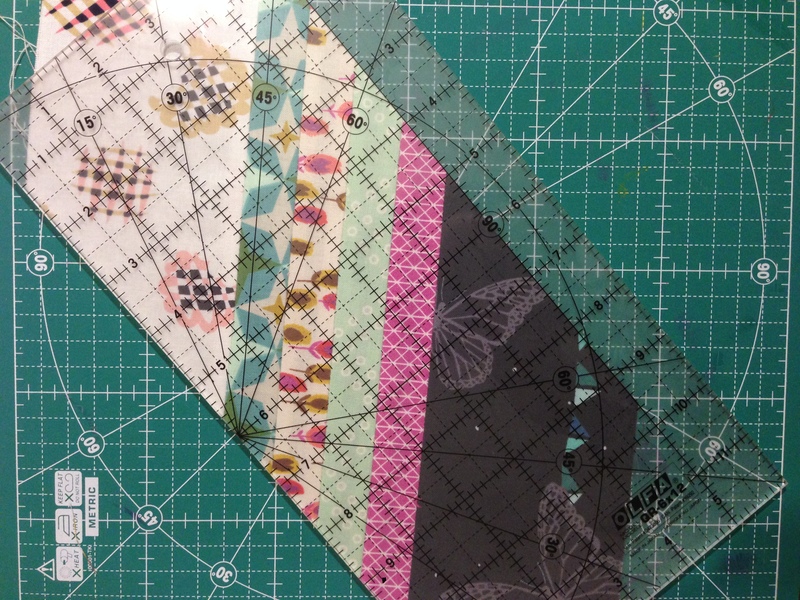 This is how my very first foundation paper piecing looked like when I was done! I hope you give this method a try if you haven’t already! I’m looking forward to completing more sections of #metroarea pretty soon! Almost three weeks ago, I completed six blocks of the #westside quilt from Patchworkcity by Elizabeth Hartman. The blocks I completed are Elevator, Forest Park, Favoirte Sweater, River Walk, Apartment and Streetlight. Until now, I’ve enjoyed working on all of these blocks though some I enjoyed more or less. Favoirte sweater was one I enjoyed the most as I was curious to see how all the steps lead to the final ‘zig-zag’. 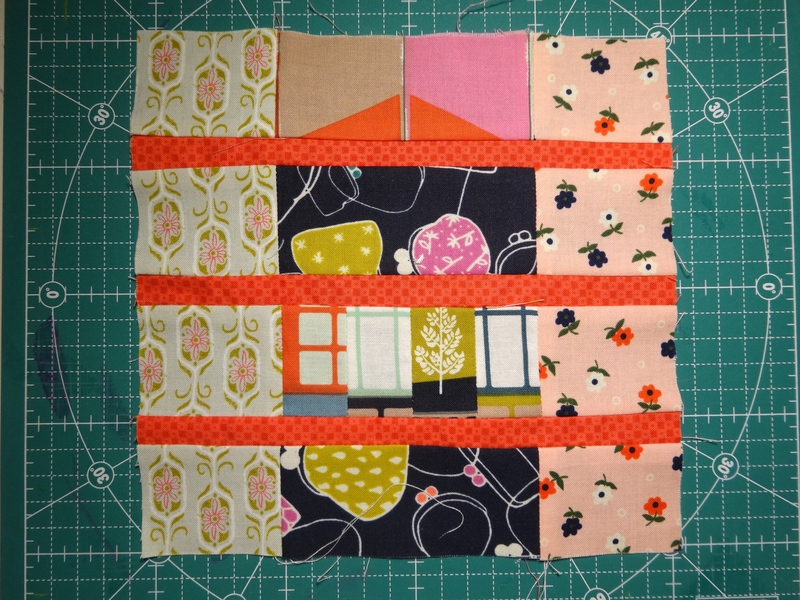 Doing these blocks, I spent a lot of time choosing fabrics from a bundle that I receive from my #patchworkcitybom subscription by The Intrepid Thread. I did, however, mix some of my own stash as well. 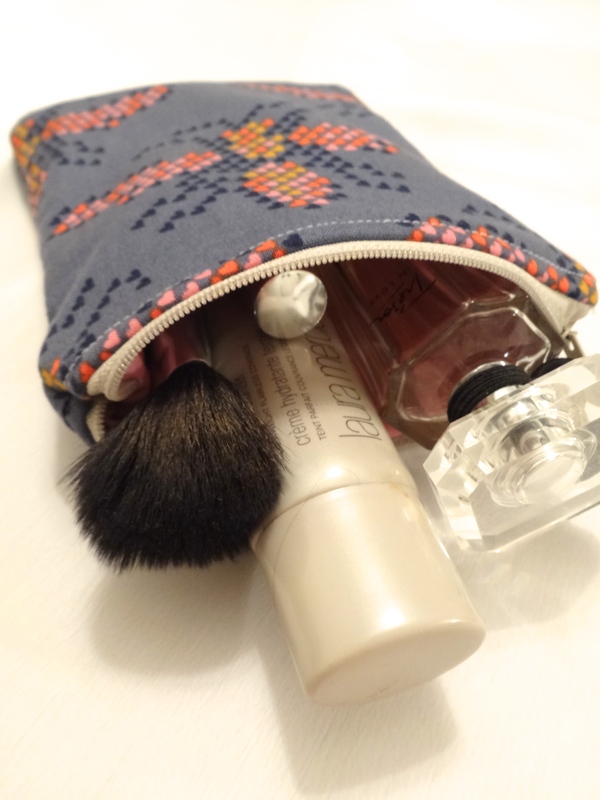 I got the idea of doing that from a fellow blogger, Allison Schnackenberg from the Savage Pink blog. 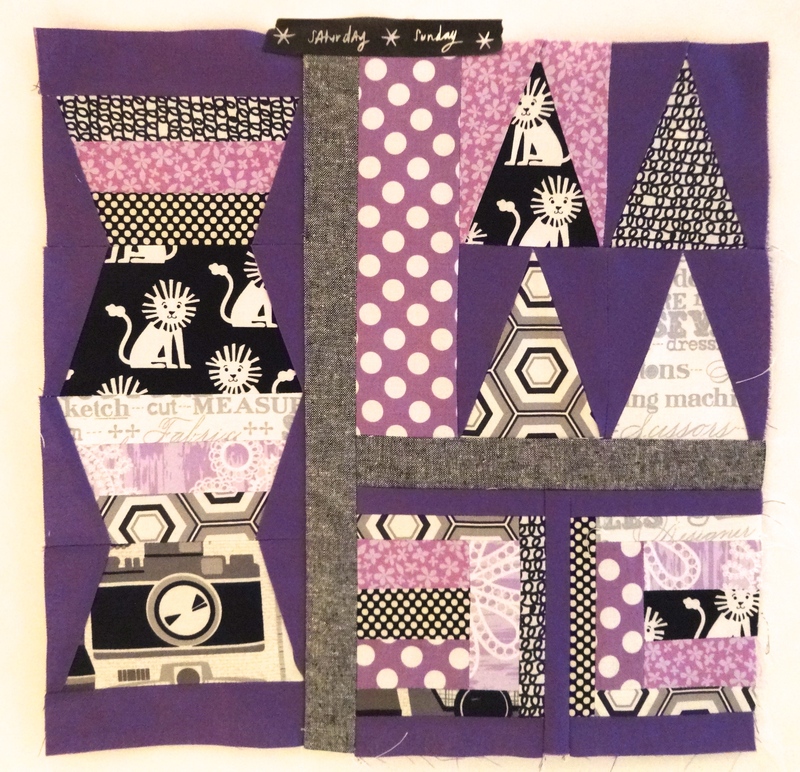 I was searching for inspiration on the fabric combination/choice for one of my earlier blocks and I coincidentally came across her blog. I liked how she was using her own stash and not limiting her creativity to a bundle that was given to her. What I also liked about her is that she had a vision of how she wanted her quilt to be. 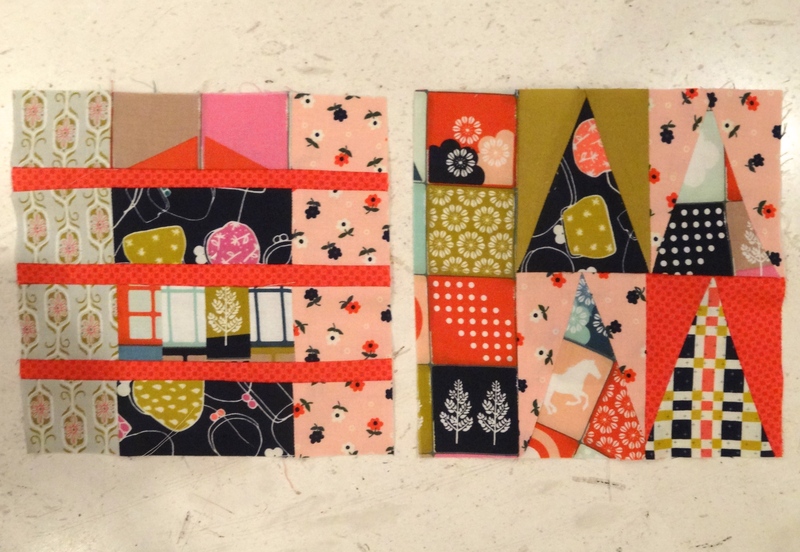 She felt that she wants to convey the ‘Urban’ life that Elizabeth Hartman is portraying through her block construction and fabric choice. What a lot of people around me don’t get is that ‘patchwork’ and ‘quilting’ each is an Art that a lot of us take very seriously. It is not a matter of cutting and sewing fabric pieces together. It is in fact a very well thought of process. 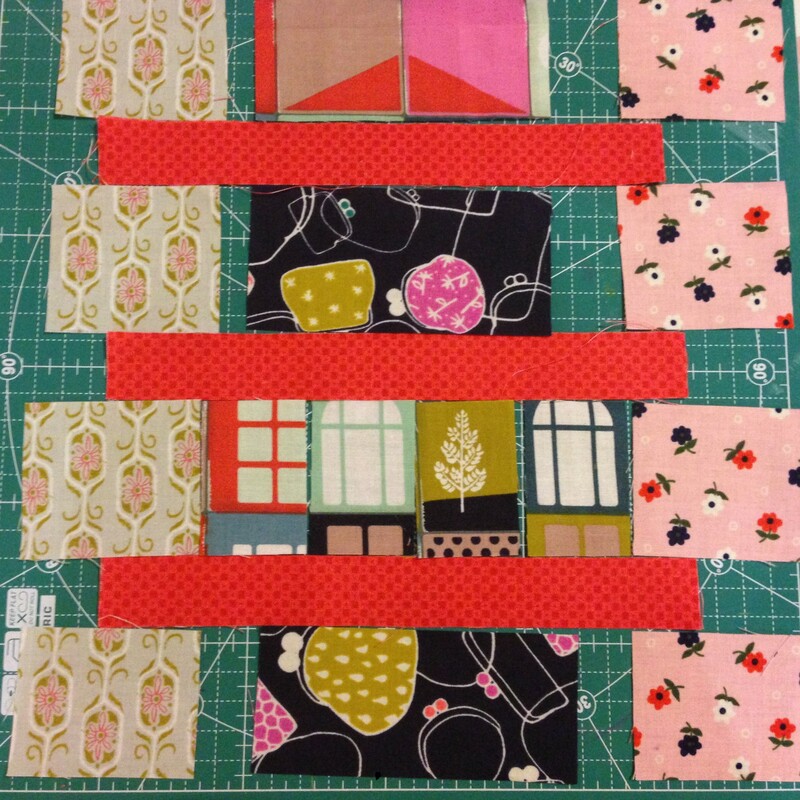 There has been a group on facebook for anyone working on #patchworkcity. This group has been awesome. I truly cherish the interaction of my fellow quilters on that platform. One of the group members was kind enough to share with me her methodology when it came to planning out the color scheme of her quilt. She drew blocks on a piece of paper, coded them, and colored them with her four main colors. This way when she’s working on a block she knows which fabrics to use, which fabrics to focus on and this way she’s creating a balanced use of color throughout the quilt. Regarding the blocks I’ve completed until now- I truly like Favorite Sweater, River Walk, Apartment, and Streetlight. I like that the color mood is the same throughout these blocks. Also, the fact that they are generally the correct size thrills me! 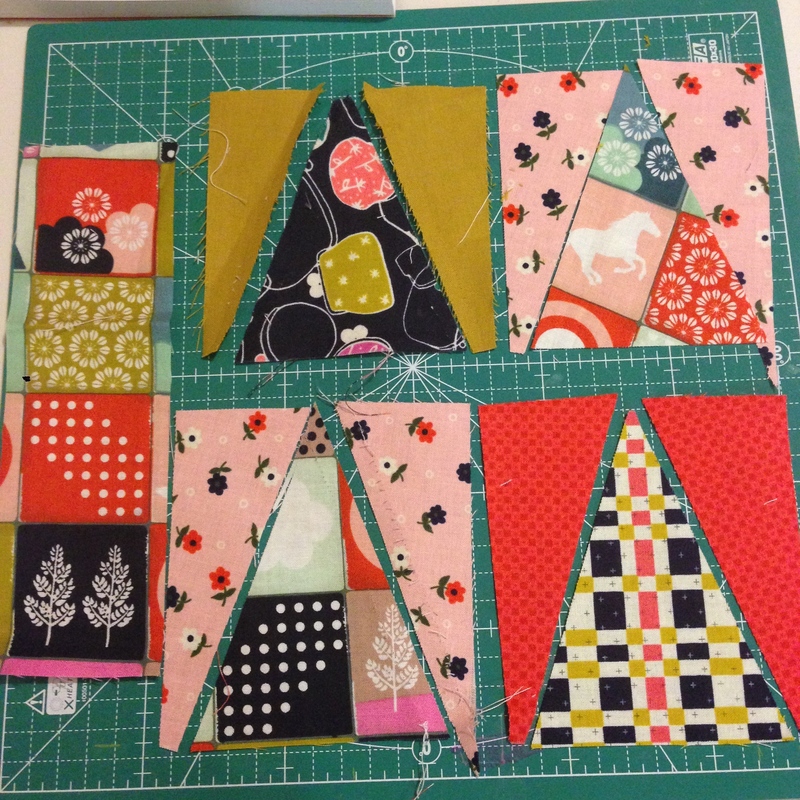 The first two blocks, Elevator and Forest Park, I trimmed out for the wrong measurement (8″ by 8″). Since Elevator and Forest Park were the very first blocks I made, I did not have a vision of the color scheme/mood I wanted to follow. 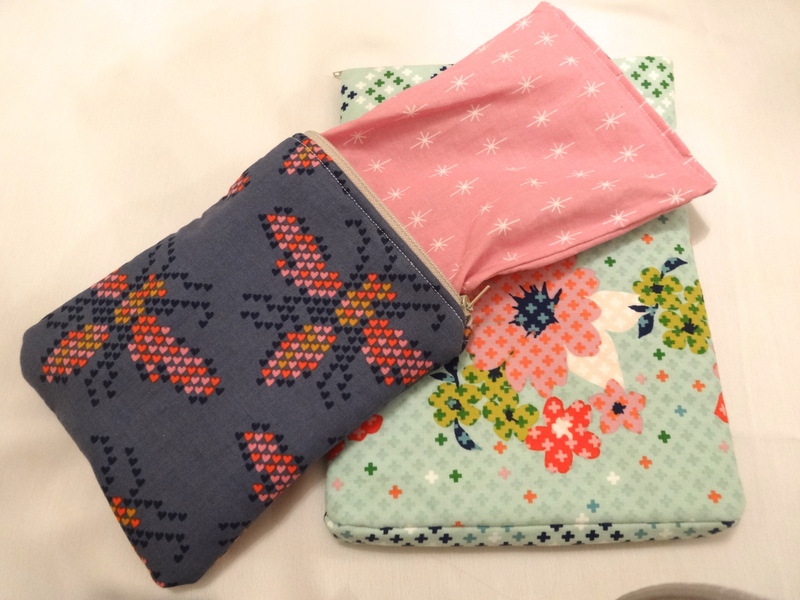 I merely used the first bundle of fabrics I received and constructed the blocks. I actually think I may redo them once I am done with all the blocks. With the other four blocks, I maintained a turquoise/pink/navy color way. I decided to focus on the red color in Apartment, because I want to gradually add more red to my blocks. My color focus will then be on turquoise, pink, navy blue, and red. I’m not sure if I’ll add some green to the mix- I received green fabrics from the BOM. 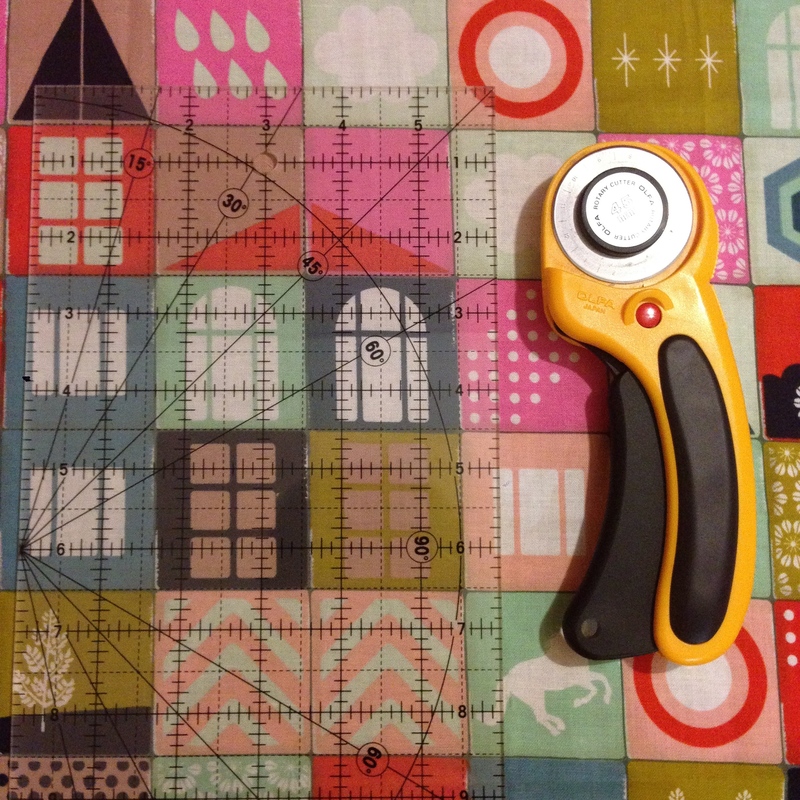 Before working on my new bundles from the BOM, I will follow the methodology described above by a fellow quilter. I’ll draw blocks on a piece of paper and color in the ones I’ve done already and perhaps this way I can better plan my color scheme while maintaining the color mood I already achieved with the blocks. I usually spend a lot of time choosing my fabrics for each block. I do not only think of the block itself but also the big picture. I will try to avoid this head hurting process this time by following the color planning method described above. 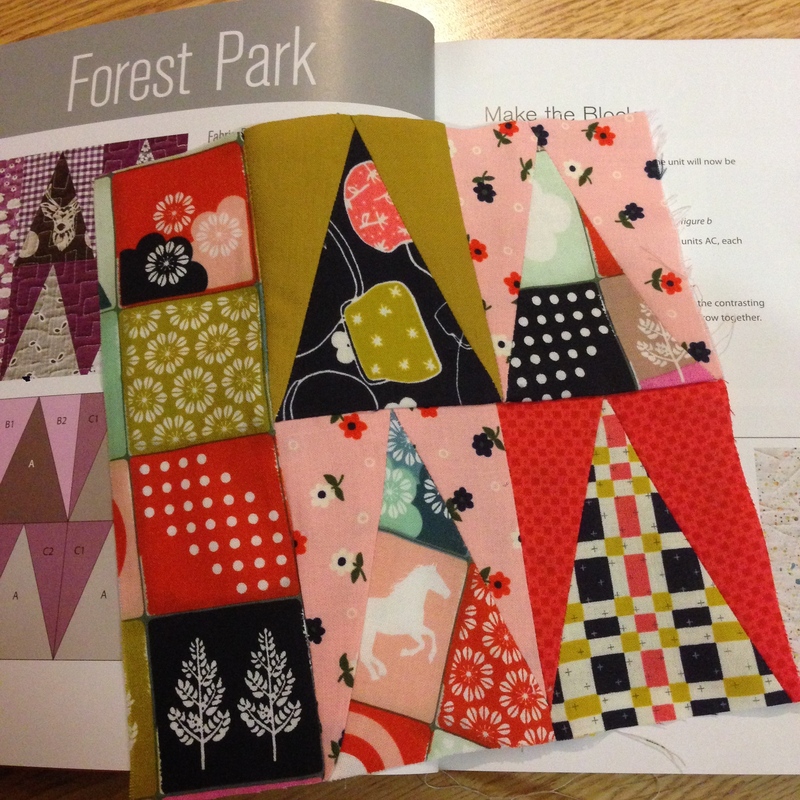 Don’t get me wrong though, I enjoy choosing my fabrics- it’s truly the most enjoyable part of the Westside quilt! Let me know what you think about the blocks I’ve completed so far! My dad told me the other night while I was heading to my bedroom/my working space- what I flatter myself and call my studio- “read as well.” I looked at him and said “yes Baba I do read.” He was relieved that I did not consume all my spare time only sewing and quilting. I then headed to my room and grabbed my current reading which is a memoir by Jean Said Makdisi, the sister of the well known scholar Edward Said. I took the book and showed it to my dad to reassure him that I do read as well. When I was a kid I have to admit I wasn’t a reader, but in the recent years I grew to enjoy reading. I feel like reading books gives me energy and feeds my knowledge. Obviously the impact of reading on myself depends on the genre of the book I’m reading. I love fiction books. I can finish them in a few days because generally I get hooked into reading them continuously. Those books are fun and I feel sad when I reach to the end of them because I no longer live with the protagonist and antagonist. The other type of books I also enjoy reading are memoirs and self-help books (that are more in the style of memoirs). When studying at McGill University in Montreal, Canada I took an elective called “Muslim Societies” where the professor, Laila Parsons– daughter of a previous British Ambassador in Iran- focused on three main regions: Egypt, Palestine and Iran. 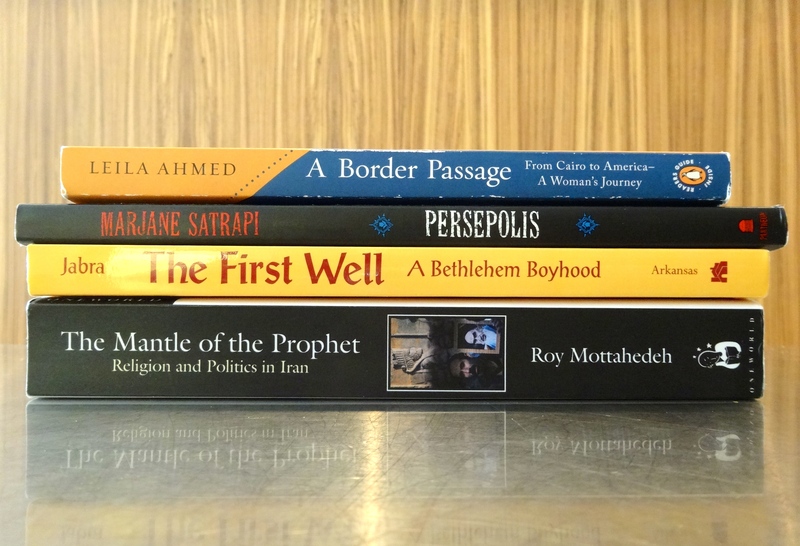 The way we studied the history of those regions was mainly through reading memoirs. We would read two memoirs from two different perspectives. It made learning the history of the regions very interesting because we are exposed to two different perspectives on the same era. 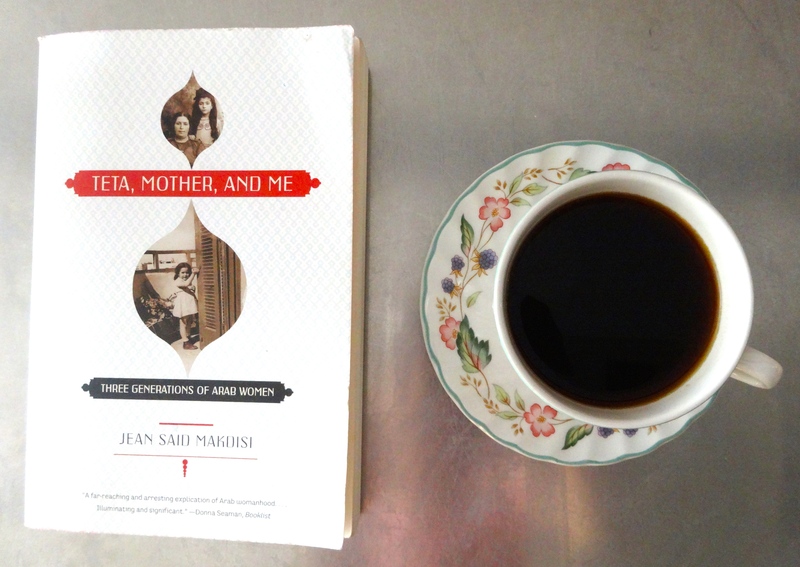 The memoir I’m currently reading is called “Teta, Mother, and Me: Three Generations of Arab Women” by Jean Said Makdisi. 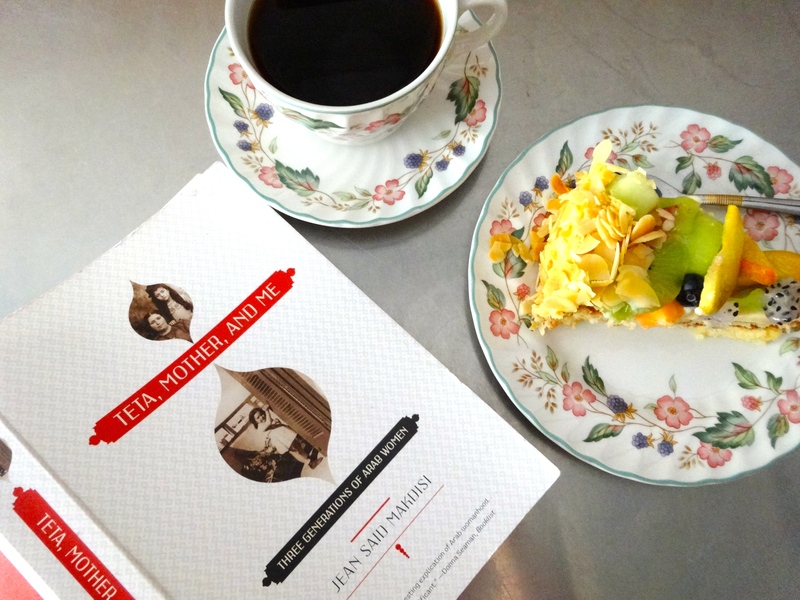 This memoir was actually recommended by Professor Laila Parsons back at McGill University. I’ve been wanting to read it since but I never got about purchasing it. It is interesting to learn about the 19th-20th Century Arab community and generations in Palestine, Egypt and historic Syria (Syria, Lebanon and Jordan), Christianity, and life in Palestine before the Nakba in 1948. The Nakba refers to the Arab-Israeli war and what resulted in the exile of hundreds of thousands of Palestinians from their land. Jean Said divides her memoir into four parts: In my own Time, Teta in History, Mother’s World, Women Together: Mother and Me. I read part one of the memoir and now I’m well into Teta in History. Teta means ‘grandma’ in Syrian/Labenese/Jordanian dialect. 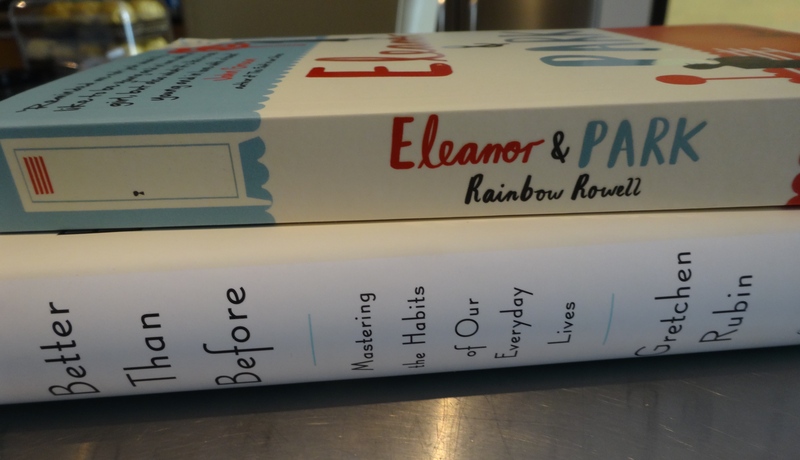 I have two books lined up for my next reads: Better than Before by Gretchen Rubin and Elanor and Park by Rainbow Rowell. I also want to read the memoir by Edward Said. I’m interested to read about Edward’s life, his perspective and how it would differ than that of his sister, Jean. 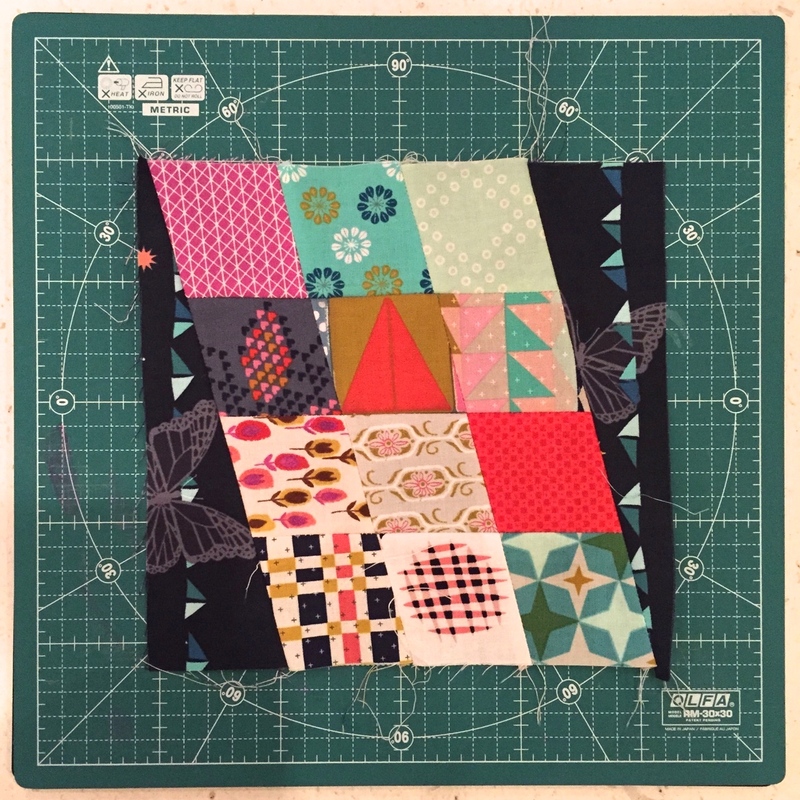 Today I’m sharing with you my first two completed blocks of the sampler quilt, Westside, that I’m working on from the book Patchwork City by Elizabeth Hartman. I realized that last time I did not elaborate much about the work Patchwork City. I kind of assumed that you all knew what it is about. I realized though that it’s an assumption I made and on the contrary those not in the quilting world have no clue what it is all about. 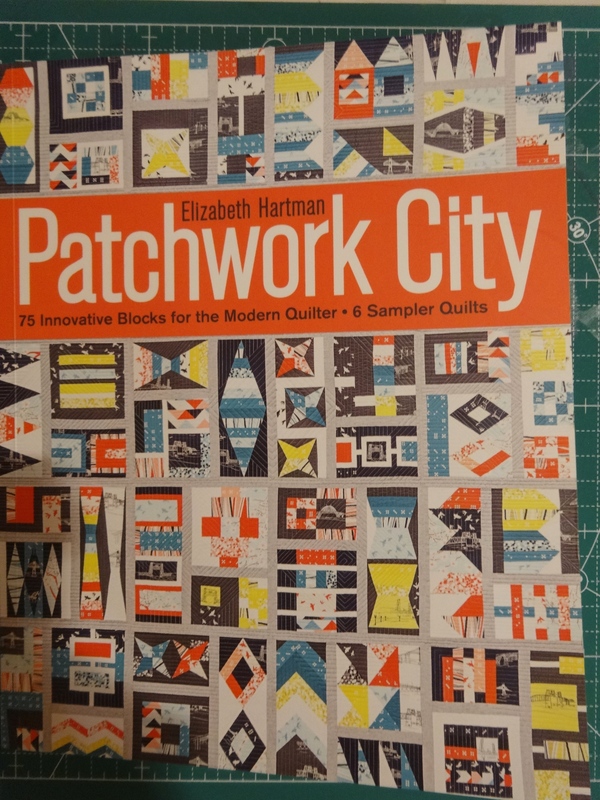 Basically, in this book, Elizabeth Hartman presents “75 Innovative blocks for the modern quilter”. 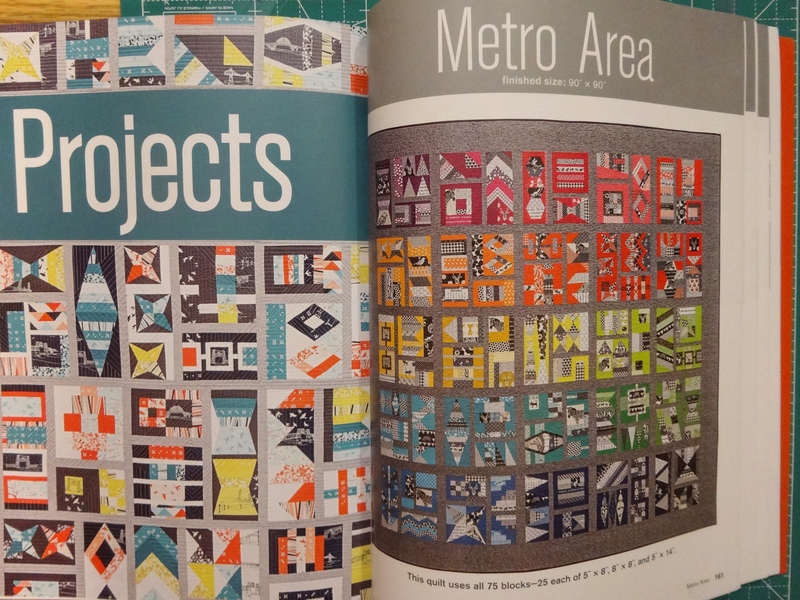 At the end of the book she presents 6 sampler quilts, and I’m doing two of those named Metro Area and Westside. Metro Area uses all 75 blocks while Westside uses all of the 8″ by 8″ blocks. Some of these 75 blocks are constructed with basic squares or rectangles, while others are done using patterns supplied by the designer herself. The challenge is working with patterns; I’ve never dealt with patterns before. Although I started my first quilt two years ago; however, I’m pretty new to quilting. I only did basic cutting and hand sewing. Westside and Metro Area are literally my second and third quilts and so I’m learning a lot while doing them. 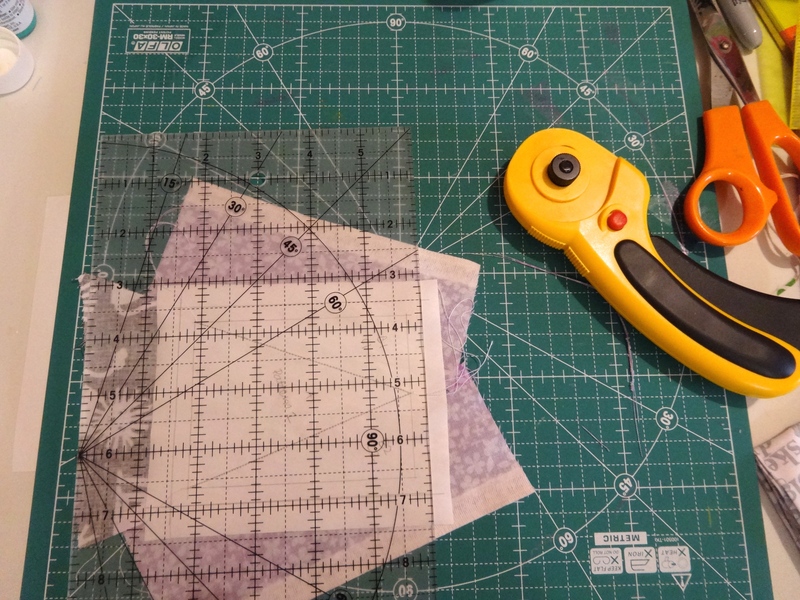 Plus this time I’m actually using the ‘basic tools’ often listed by many quilters such as the cutting board, rotary cutter, non-slip rulers, ruler with 1/4″ seam allowance, freezer papers, etc. 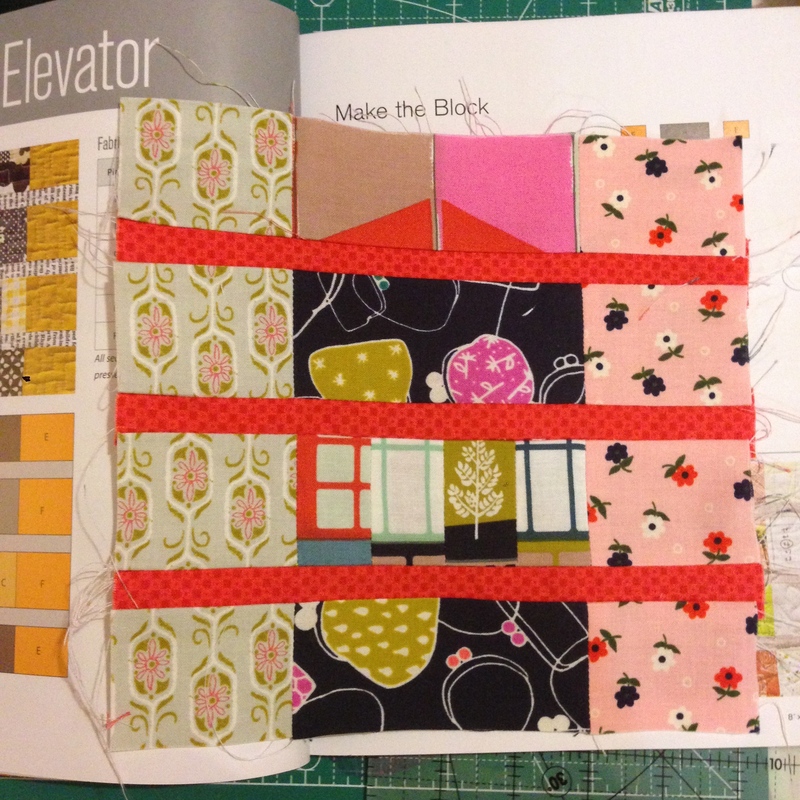 I started with the #Elevator block as it was easy and straightforward in terms of measuring and cutting; no patterns required, no tricks and special techniques. What took time was choosing the fabric combination that spoke to me. About fussy cutting, I came across this term several times before and I thought it meant something complicated. When I looked it up, I was surprised that it referred to literally ‘being fussy’ and cutting fabric while targeting a particular motif.. that’s all!! It is one of the first terms I tackled, learned. 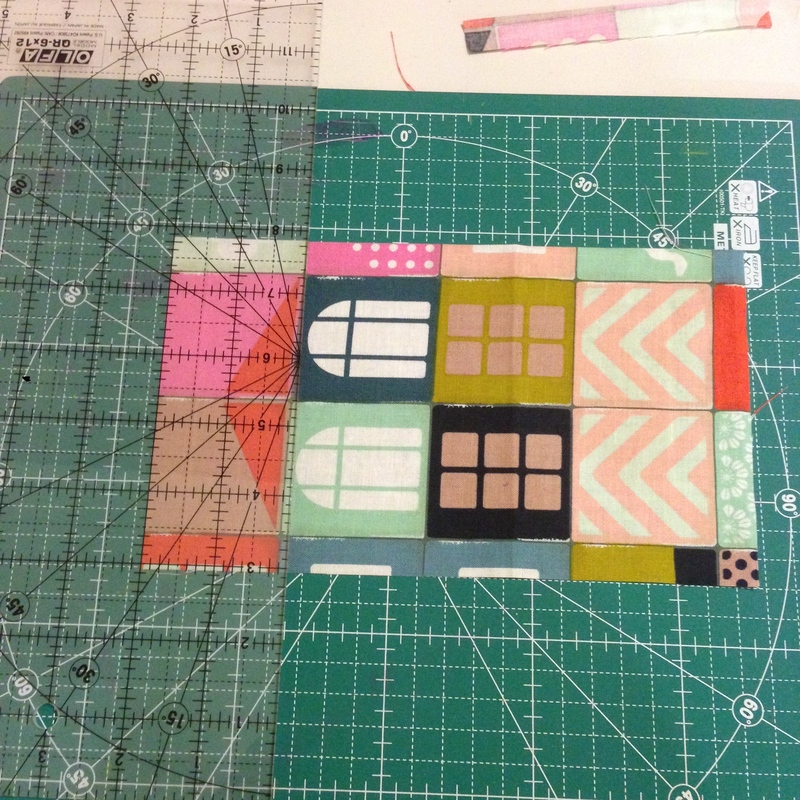 “Measure twice, cut once.” If there is anything I should emphasize from my experience doing these two blocks is this: “Measure twice, cut once.” This is sooo important and it will save you lots of time and headache of re-measuring and re-cutting. Be sure to measure your pieces twice or as many times until you are certain of your correct measurements. Finding out that your measurements are incorrect when you’re about to sew the pieces is one of the worst feelings- plus it is just a waste of fabric to cut incorrectly and re-cut fabric. 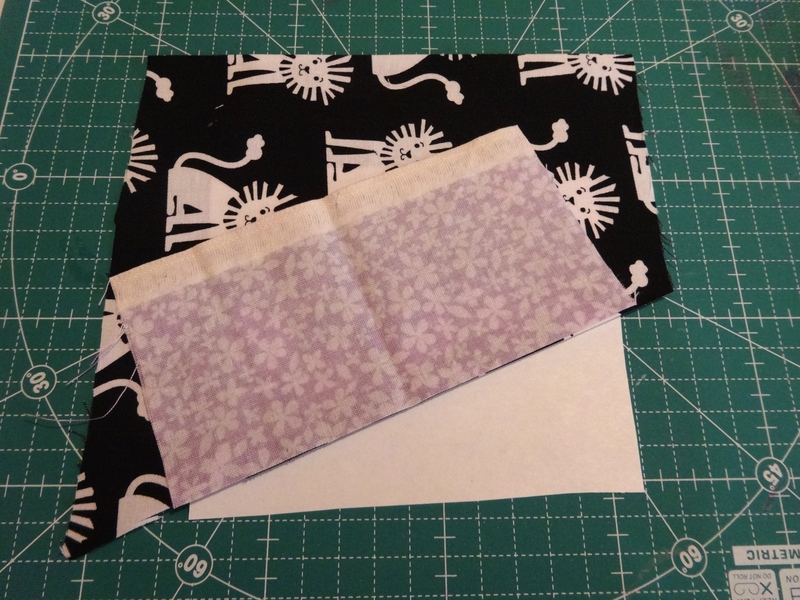 Another challenge I faced when trying to sew the pieces together is to stick to the 1/4″ seam allowance. I’m very new to a sewing machine and thus getting an accurate 1/4″ seam allowance is a bit tough, but overall I think I managed successfully to get that done almost accurately. The second block I did is #ForestPark. 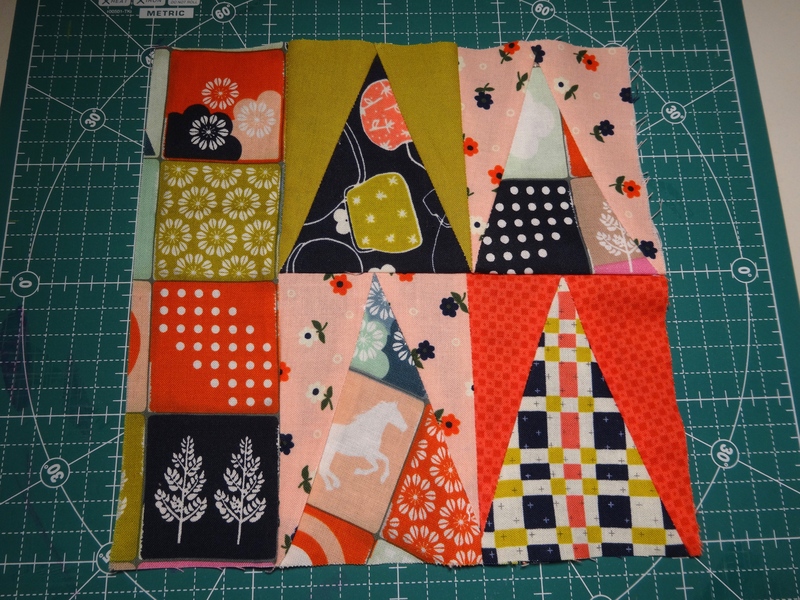 For this block, I had to use the pattern templates provided by Elizabeth. I traced the patterns on the freezer paper since my printer would not print on them- a paper jam occurs. 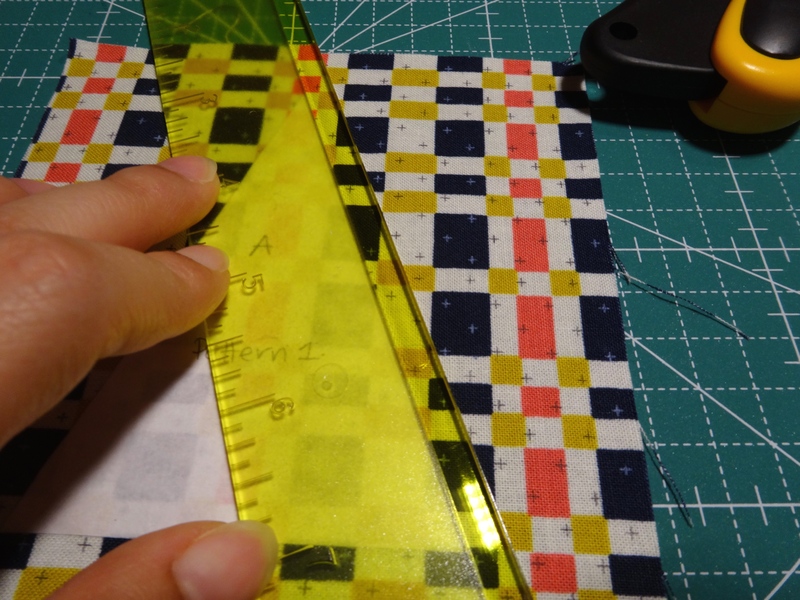 After that, I used an Iron to press the freezer paper to the fabric and then I used my special ruler to cut the pattern with a 1/4″ seam allowance. That done, I had my pieces ready for piecing. All that was very easy. The difficulty I faced was in piecing. 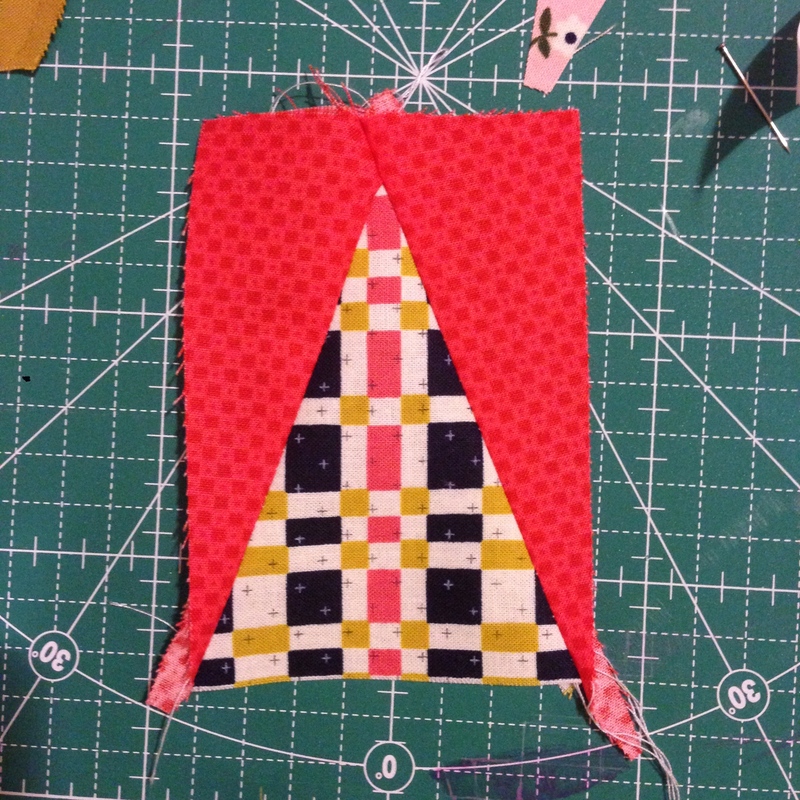 On my first attempt of piecing the triangles together the result was off. I decided to undo it. Then I asked some fellow quilters working on the same project for some advice. They told me to pin it, to make sure the side triangles overlapped; some others told me to use the paper-piecing technique (but I wasn’t ready for that just yet). 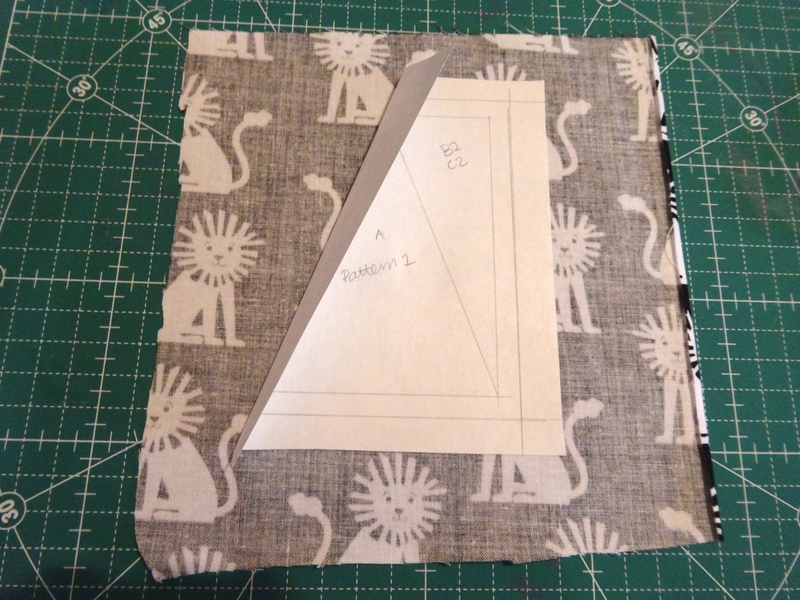 I pinned the pieces and sewed really trying to accurately follow the 1/4″ seam allowance. The other problem I faced was that my blocks would be small, not quite 3.5″ wide as they should be. They were even less than 3.25″. 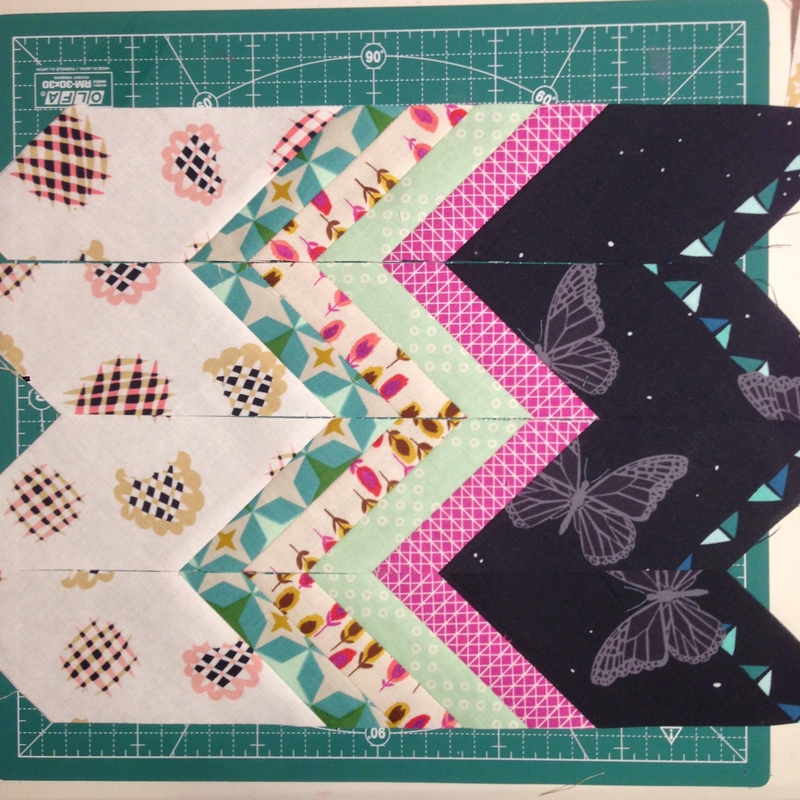 Again, I decided to undo and make sure I sewed the pieces at 1/4″ and maybe a bit less to get my blocks wider. 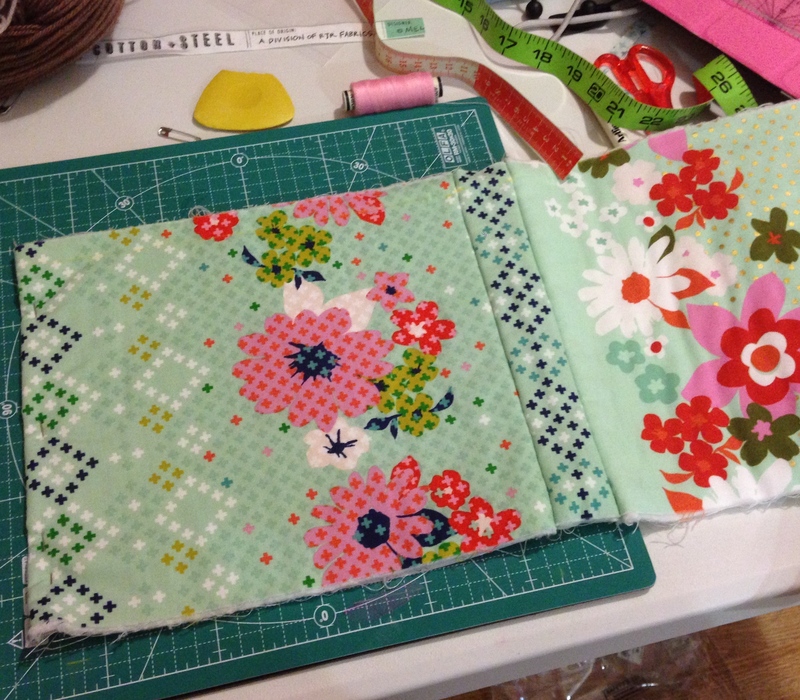 Many trials, sewing, undoing, resewing and I finally was content to what I reached to. I was worried that the final #ForestPark block would be less than 8″ by 8″ but in fact it was not! Yayy! I was very pleased! – Measure twice cut once! 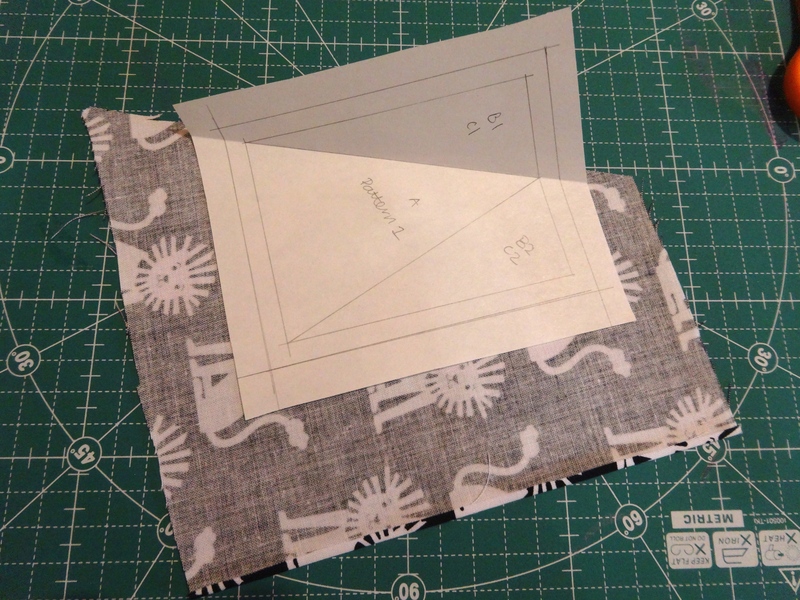 – When dealing with patterns, make sure to really measure and cut for 1/4″ seam allowance and to sew to that measure. Accuracy is much needed to achieve the overall correct measure of the final block. – Don’t worry if you spend too much time choosing and coordinating your fabrics. Honestly, this is the fun part of the process!! I really enjoy it! Yes it gives me a headache sometime but I find it the most enjoyable part, because after that there isn’t much creativity since you’re following the directions of the book. – It’s okay if you do something wrong the first time around. Don’t feel discouraged; just try again. My next block in the making is: #FavoriteSweater. Cannot wait to share with you my experience with that block. Please share with me your experiences and blocks! 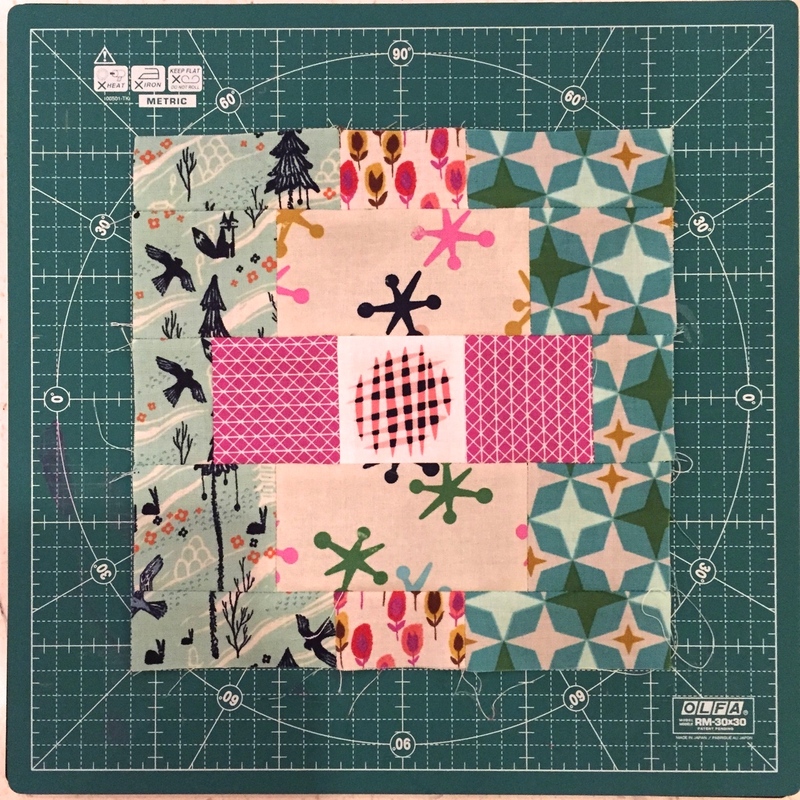 Last month, I found out that The Intrepid Thread has created a group #patchowrkcityBOM where you can subscribe and get your monthly bundle of fabrics to create two blocks of either the #metroarea quilt from Patchworkcity by Elizabeth Hartman or the #westside quilt or both. 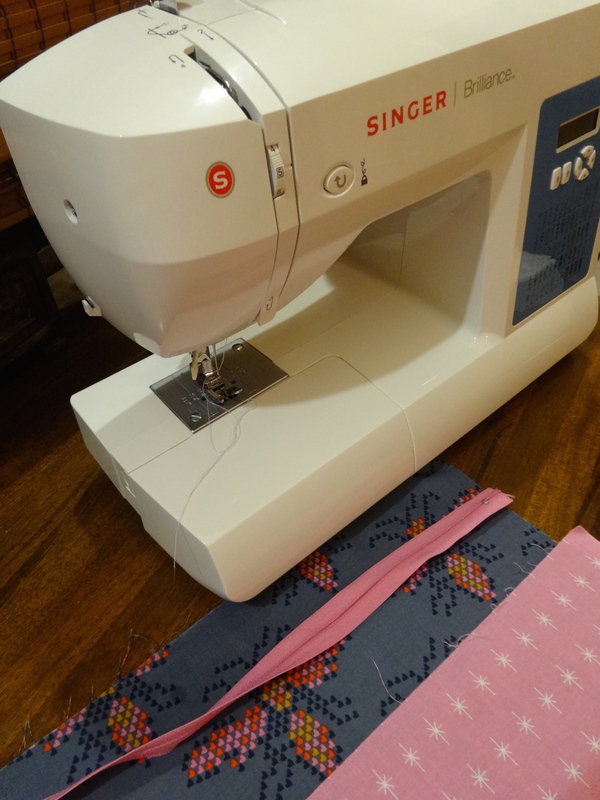 I was so excited about it and it was exactly what I needed to get these quilts started. I subscribed to both #metroarea and #westside. By the end of the year, all subscribers will complete all the blocks and hence the tops of both quilts. Last week, I was very thrilled to receive my first package which contained the sashing and blocks for the first three months of #westside. 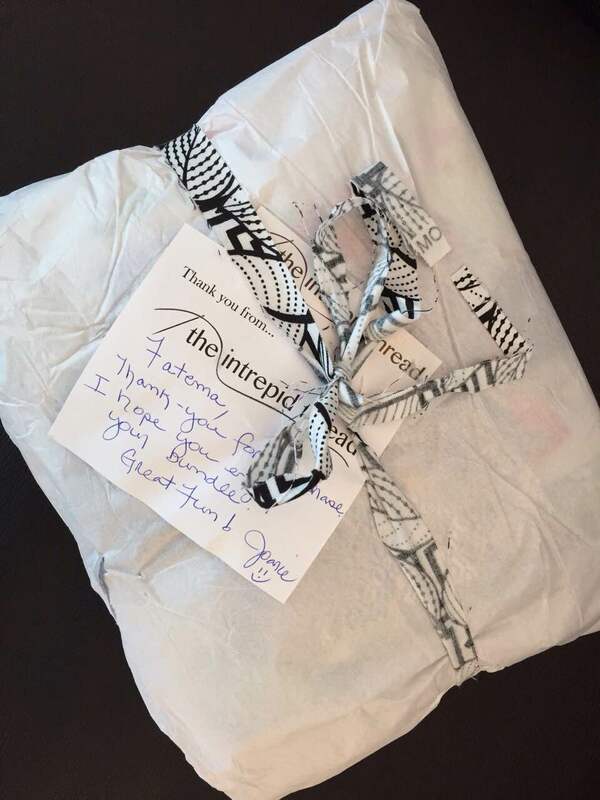 The packaging was great and at that moment I knew this subscription is totally worth it! 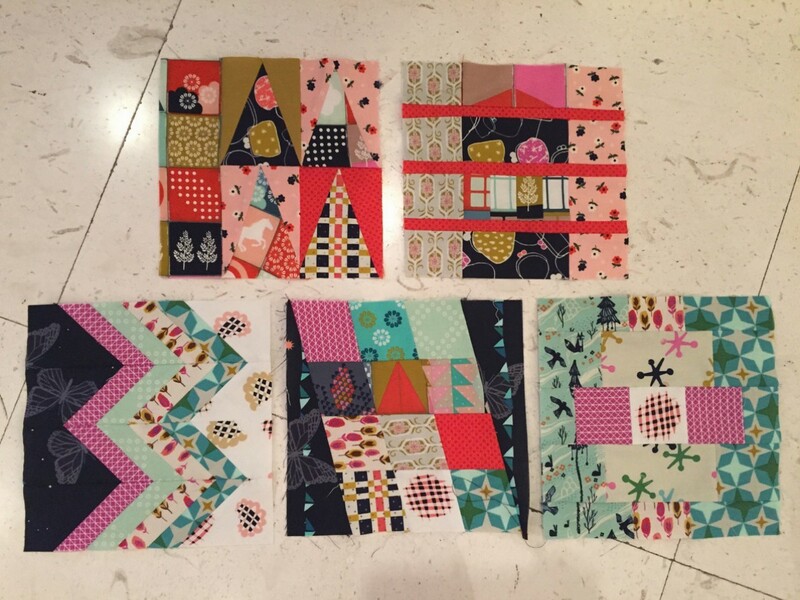 Julie from The Intrepid Thread is also kind enough to send out a monthly patchworkcity newsletter, where she shows the blocks she’s done and any tricks or tips that may be useful. I’ve never tried paper piecing so this will be a challenge that I’m willing to take on and try. I’ve read a lot about it this week and watched some youtube videos. I came across different types of paper piecing one of which is the ‘English Paper Piecing’. 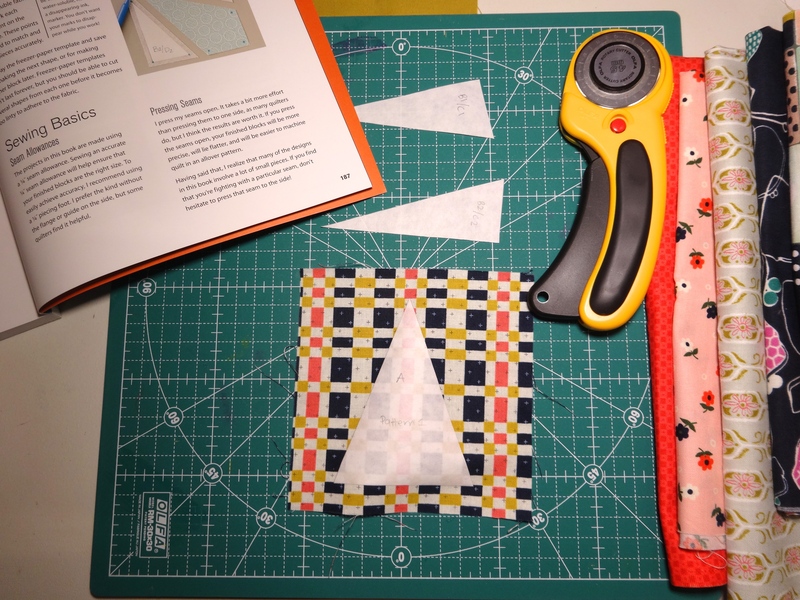 This particular paper piecing method is used to create the #lapassacalglia quilt from the Millefiori quilts by Willyne Hammerstein. I’ve seen a lot of Instagrammers making the rosettes for this quilt and oh my gosh they are so prettyy!! I think this will definitely be my next big project! Today I will start working on my blocks. I’ll give you updates soon!